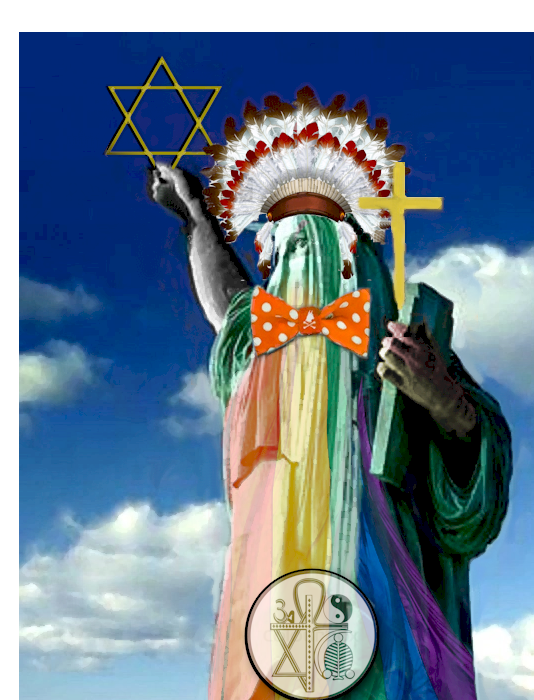 Welcome to Our Lady Liberty! How’s She Doing? History, facts, pictures and information about how we came to have The Statue of Liberty; what she meant then and what she means today. Yesterday Was National Moon Day and for me, it began with a status on my sister’s Facebook page and an incredible picture. Even though I live in New York, I do not live in New York City and I have never seen the Statue of Liberty in person. But she is an icon and a symbol of so much that evokes so much emotion and captures in her meaning and visage, the United States of America. She is on my ‘bucket list’ to one day or night, to experience with my own two eyes. 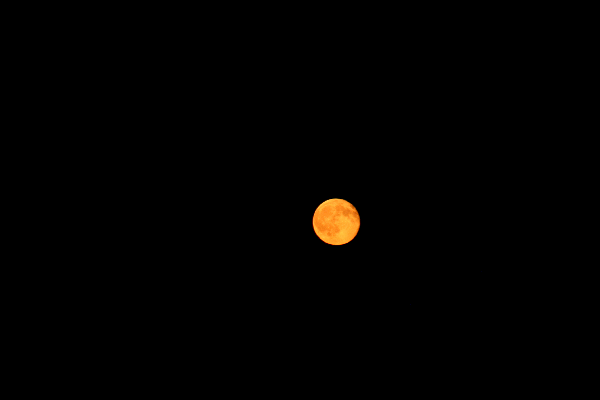 I was aware that the full moon of this month is called the Buck Moon, the Hay Moon or the Thunder Moon, according to the Farmer’s Almanac. 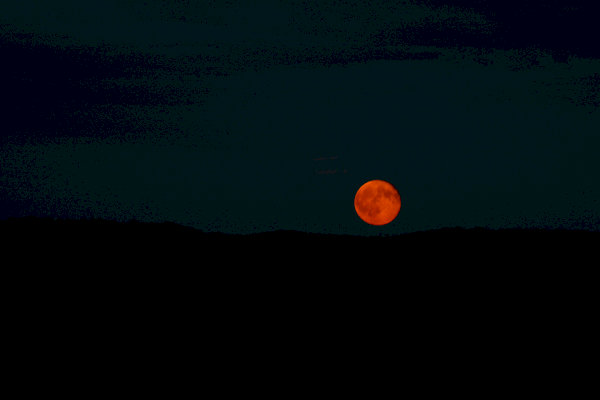 I had recently heard that if the conditions were right, I just might be able to see it as a red moon this month. 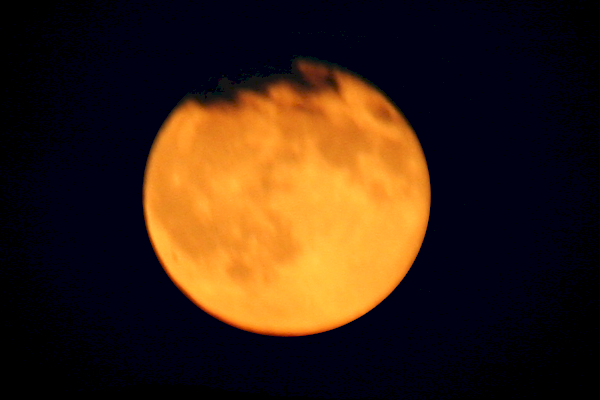 I am not too good at taking decent pictures at night with my cell phone, so it was time to take out my big-boy camera and tripod, to see what I could capture. As the following pictures show, my views went from red, to golden and then white as it was when I took it, high in the sky at approximately 1:30 AM, eastern standard time. Though the quality of my pictures are not the greatest, I marveled at their beauty in my own two eyes and the change of color, in such a short period of time. Earlier on the Wednesday 7/20/16, I was watching the news on TV, around noon. On July 3, 1995, astronaut Eileen Collins became the first woman to pilot a space shuttle and she was scheduled to speak in Cleveland, OH, Wednesday evening, 7/20/16. She became the first female shuttle pilot and commander to speak at a Republican National Convention. And why not, this is, after all, America! I put two and two together (or three)— National Moon Day, Collins speaking at the convention and on 7/20, 47 years ago in 1969, the United States Landed the first people EVER, on the Moon. I knew I wanted to hear Collins speak, but I caught very little of it, as I was trying to get set up to take pictures of the moon. I am glad it was re-broadcast and I caught it later. I saw a lot more than I was expecting! Some people were a little upset that a certain former candidate did not endorse the republican nominee for president and there was some booing. Someone (someone against all of this) was quick to call them, “howling lunatics.” I wonder if they knew there was a full moon out and howling refers to wolves that supposedly howl when the moon is full? “Lunatics” has as its root, “luna,” which refers to the moon. I only mention this as we seem so divided now, perhaps even more so or at least equal to, the times of the so-called Civil (which I call the UN-civil) War? This division among us seems especially true politically, anyway. It seems WE has all but been replaced with ME? The sun rules the day and reveals so much. It is too intense of a light to look upon with the naked eye, so we look down and at what lies before us. The moon rules the night. It is a light in the darkness. We are drawn to this, especially when it’s full, like a moth is drawn to the flame. We look up at the moon and wonder and dream. How long as a nation, as a people, have we had vision, for the future or dreamed? Not howling our discontent at the moon like lunatics, but dreamed? We are now a people who are concerned or worry over or fear our future. The world seems on fire and even our neighborhoods, don’t feel safe anymore. Who has time to dream if you’re just trying to survive from pay check to pay check or just to get through the day? Now, people can seize upon these doubts, worries and fears and provide vision and leadership or keep us blind and divided. We used to be first at so many things. This is what made US, a ‘superpower’ in the world! WE had vision! This is what allowed US to become the greatest superpower, the world have ever known! WE were first because, WE were unified! WE had vision because, WE had the Liberty to DREAM! Let US, WE the People, with the American Dream, rise up together with this vision! Let US lead ourselves and our children; our families and friends and the strangers among us and the entire world! That’s what it means to be First, to have Vision, to draw out from the darkness to the Light of Liberty! Let US DREAM again, DREAM first and DREAM big ! At the end of this day, in trying to hear the speech by our country’s first female astronaut commander, I saw the following video. Enjoy it and share it with everyone, whether you are a Republican, Democrat or Independent! 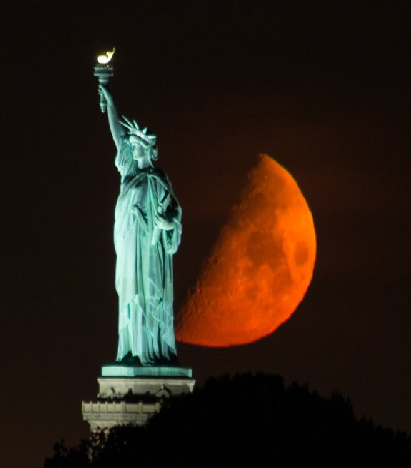 Just look up at that moon in the night sky and DREAM because, Liberty allows US to be, WE the People and do great things, for ourselves, each other and the entire planet! Now as to the word “men,” if you believe it was just an all-inclusive plural pronoun or that the founders really only believed that men and only men were created equal and only they were endowed by their creator with certain unalienable rights (rights which cannot be taken, surrendered, bartered or sold), does not diminish its inherent and inerrant truths! WE, that hold these truths are every man, woman and child the world over. Our republic, our form of government put them into writing in the Declaration of Independence and the Constitution of the United States of America put into writing, the defense and preservation of these truths! WE the People are, the Hope of the world! Click the picture for full size and then right-click (twice) to save the full size image. On a touch phone, touch the image twice and save it to your pictures. Go to settings and choose this as your wallpaper for your home and/or lock screen. It will automatically be re-sized to your phone’s standards. 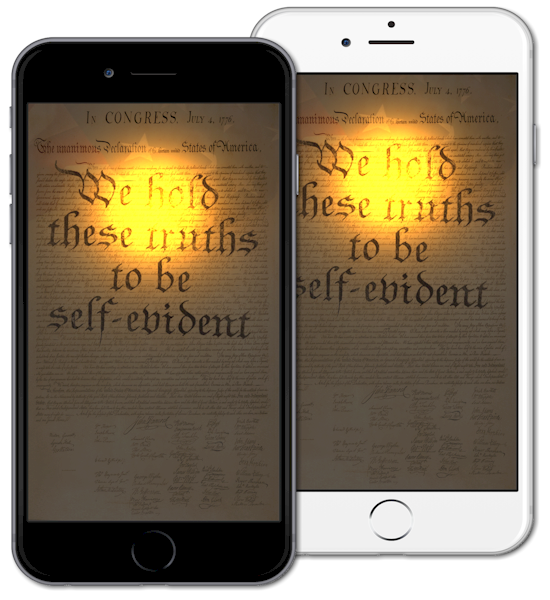 FREE copies of The Declaration of Independence are available from many, many sources. You can read the words on paper, read it online, copy the words and paste them to your document program or application and print them from your printer. You can also download FREE digital copies or eBooks, from Apple’s iBooks etc. Just do a search for the device and format you are interested in. 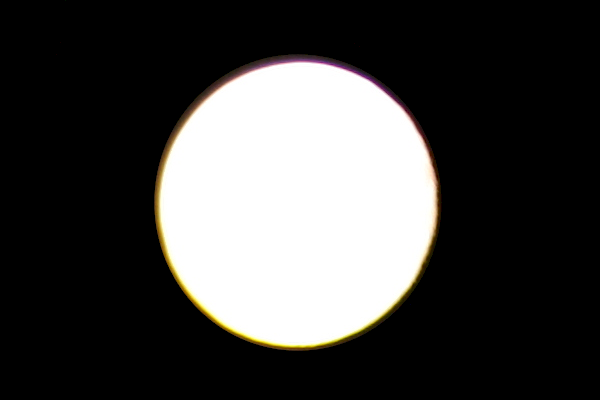 Here is one source that has several formats available and all, for FREE. But what I love the most is you! America the Beautiful was written by Katharine Lee Bates and composed by Samuel A. Ward, “America the Beautiful” is one of the most well-known and beloved American patriotic songs. 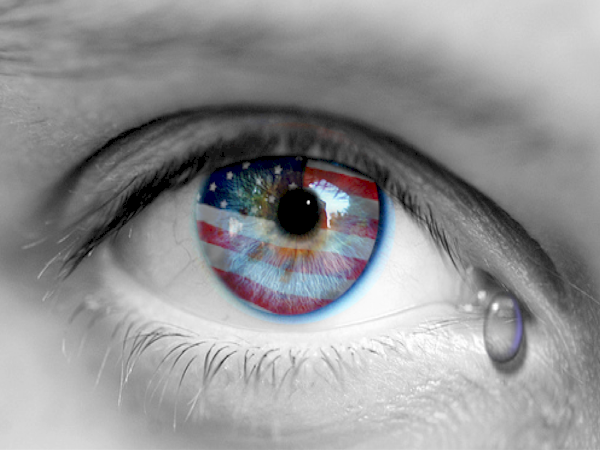 The song celebrates the natural beauty and the “patriot dream” of the United States. Them that feign the words or refrain from the deeds of true words spoken, do not diminish the true! HAPPY 240th 4th of July! In 1903, the poem was engraved on a bronze plaque and mounted inside the lower level of the pedestal of, the Statue of Liberty. The simple answer to all the above is the same as her name – LIBERTY! OMG, I wrote the word God. Yes, because that’s exactly what it says and what it means and what I meant and what I mean. And I said it standing up, without a hat on my head and my right hand over my heart. the non-religious – the religious – and the legal beagle (yep, like a dog on a pork chop, hell bent on not keeping the law, but interpreting the law). The non-religious, or those that do not believe in God were and are offended. OK, go sit somewhere else, provided for you, while those that want to say this pledge may, but NO, strike it out, altogether! Some, religious, were and are offended because, they have no allegiance, except to God. OK, go sit somewhere else provided, for you, while those that want to say this pledge may, but NO, strike it out, altogether! And the lawyers and the judges and the courts got involved and said, “You can’t make people say this pledge,” (never knew I had to)! OK, go sit somewhere else provided, for you, while those that want to say this pledge may, but NO, strike it out, altogether! So you don’t want to say this pledge and are offended. Well, I’m offended that you wouldn’t want to! OK, go sit somewhere else provided, for you, while those that want to say this pledge may, but NO, strike it out, altogether! So much for my pursuit of happiness, but just as long as you’re happy, I should be? Now I’ve heard, ‘Separation of Church and State,’ until I’m blue in the face. If it’s not God, from which we were endowed with certain unalienable rights that among these are Life, Liberty and the Pursuit of Happiness, then where do they come from? What is Life without Liberty? What Happiness can be pursued without Liberty? We separated from England and declared it in, 1776. We won our independence, but it seems like some, have been busy ever since, trying to separate us, from each other. 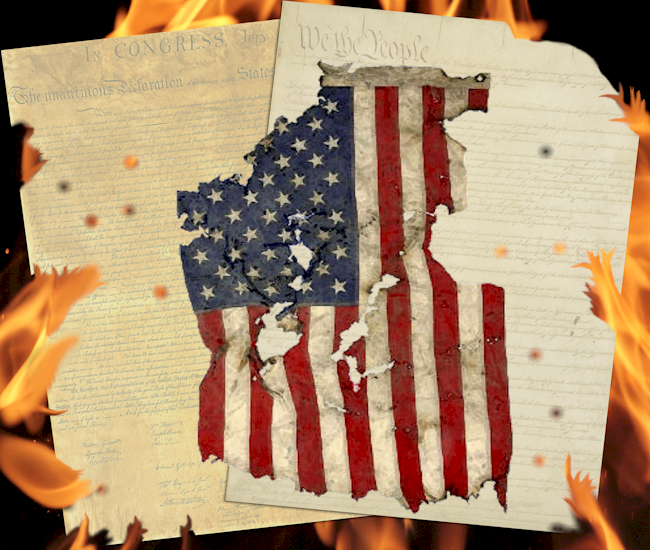 The Declaration of Independence is, separate from, Our Constitution. The Preamble to the Constitution is, separate from, the Constitution. Separation of Church and state is, separating us, from God and State. 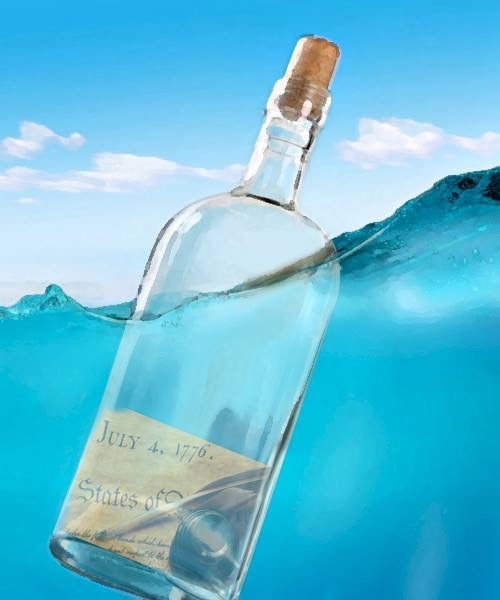 But our founding documents really have, a different view. These views are like our home. You don’t build a house, without a foundation. It has to be there, before you build the rest of the house. Our foundation is, the Declaration of Independence. Most houses have some kind of heating and cooling system, an energy source to keep it warm, cool and balanced and running. Our furnace is, The Constitution of The United States of America. In every home there are rooms. Our rooms are our rights, The Bill of Rights. Every home has a deed, an owner. Our deed is, the Preamble to the Constitution. WE the People, own this house! Most homes have a roof. The roof covers the whole house to protect it and its contents. Our roof is, God! Now before you might go and hit the roof, please allow me to show why, this is so. Did you read that our separate and equal station comes from, the, “Laws of Man” or “of Nature’s Man?” NO! Before this was written, our founders already had those and they wanted something more like, LIBERTY! When it came time to build our house, we already had a foundation. This same foundation, provides a foundation, a purpose, a reason or a preamble, to the Preamble to, Our Constitution and the Constitution. Who are these men (all inclusive noun – men and women of legal age to govern) and whose consent is required, for our servants to govern? “We the People of,” the Preamble to the Constitution are the same “We,” which hold these truths from, the Declaration of Independence. What truths – all…are created equal…endowed by their Creator with certain unalienable Rights, that among these are Life, Liberty and the pursuit of Happiness..! What are the “blessings of Liberty” from the Preamble to the Constitution – unalienable Rights, that among these are Life, Liberty and the pursuit of Happiness..! And where do those, “blessings of liberty,” come from – the Laws of Nature and of Nature’s God…,” from, the Declaration of Independence. Now the fifth amendment uses the word “property” instead of “happiness,” from the Declaration of Independence. “Property” is, the result of, the “Pursuit of Happiness,” whether it is intellectual, emotional, artistic, spiritual, financial, real or whatever it is that makes one happy to pursue and to obtain. The Constitution and the Bill of Rights, secures, protects and preserve the rights, for the individual to pursue them. It offers no guarantee that any and all will obtain, only that they have such rights as, Life, Liberty and the Pursuit of Happiness, to pursue them! 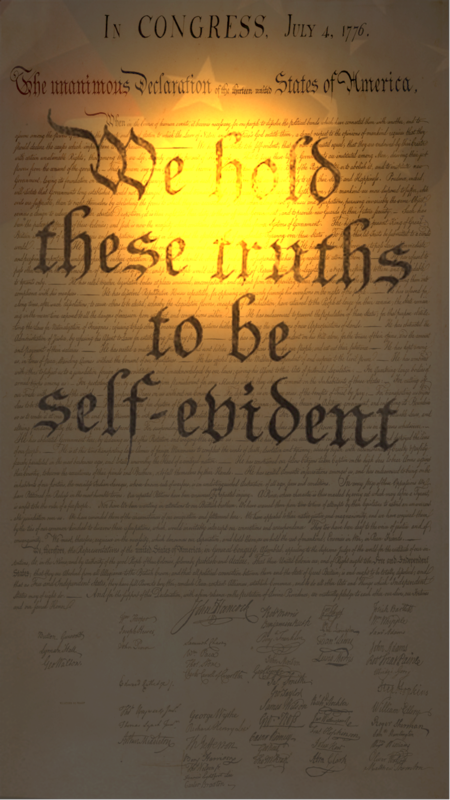 None of these documents define who or what God is, but they clearly bind US, We the People together and Our rights are clearly, distinctly NOT, from man (humanity) For what man (humanity) gives, it can take away and this is a direct opposite of, “Unalienable rights,” rights which cannot be taken, forfeited, bought, sold bartered or surrendered! Now read the pledge of allegiance again. 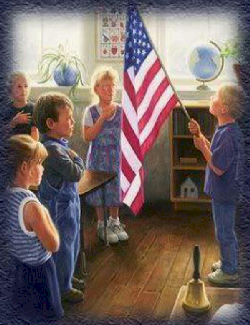 How could any one of Us, WE the People, ever be offended in taking this pledge or saying it out loud? As this began, I still think I know why, but I still don’t understand it! I’m one that freely, but solemnly makes this pledge. I am not forced or compelled to. I pledge to be loyal to, committed to, not perfect, but faithful to, not some idolatrous thing, royal or a man, and not really some flag, but what it represents. It represents the United States of America, which is not a monarchy, theocracy, democracy (rule by majority), anarchy or tyranny, but a Republic (rule of law), the Laws of Nature and of Nature’s God,” for which it stands (not falls). It is one nation, not another or other nations. And it is ONE nation “under God,” “the Laws of Nature and of Nature’s God.” And by this it is indivisible, with Liberty and justice for all (you and I and everyone) of Us, WE the People! Now for your surprise (maybe)? What you may or may not know is, Red Skelton wrote this, the whole thing. And he wrote it about two and half years before, it was first presented on TV, in 1969. He fought, for this presentation, with CBS, for 2 1/2 years. Even before he wrote this, some non-religious and some religious folk were offended by the idea of allegiance or raising your arm to take this pledge. To many, especially during WWII, it looked too much like the German salute to Hitler. So that was changed to placing your right hand over your heart or with a military salute if, applicable. And when the words “under God,” were added, even more people were offended and CBS did not want to take any heat. It was OK, to tell a story though, if it was from a third party, not yourself. So, Red Skelton made up the whole story and the teacher, Mr. Laswell. What school age child could ever remember, the entire words of this explanation? But, CBS would NOT budge. Red waited and waited for 2 1/2 years. Then the opportunity presented itself as chance. It so happened that CBS needed time to fill on the air and asked Red, to just tell a story. He did! And that is the truth, it was a story.